Ireland’s history as a people, island, oppressed British subject and eventually country goes back thousands of years. 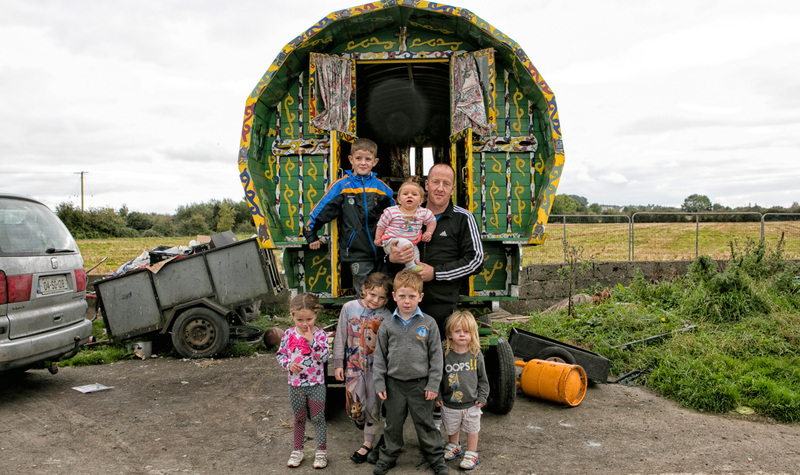 One of those traditions is that Ireland has a community called “Travellers” who are: 1) a romantic vestige of days gone by; 2) a people who need special services; 3) a people that need to be left alone; 4) a scourge on society; or 5) some other classification that defies modern societal terms. It is hard to pinpoint the origins of Travellers. Did Travellers originate with a band of people who followed around St. Patrick, St. Brigid and other Irish saints as they travelled Ireland spreading the Word? Were they people displaced by the Norman Invasion in 1171? Were they the result of English expulsion of the native Irish in the 1690s, leading to the Rapparee (Irish guerilla fighters)? Travellers’ history pre-dates the Great Potato Famine, although some believe that to be their origin. Pre-modern Ireland was a land of nomadic peoples with no central government, so pinpointing these Travellers origins is problematic. Further complicating things is that Travellers have no written history, they pass down their heritage in story telling and their educational prowess is limited due to lack of schooling on the run. But why does any of it matter? There are somewhere between 30-40,000 Travellers, about one-half of one percent of Ireland’s population. They don’t have permanent enclaves, it is antithetical to their hereditary lifestyle. By not being stationary, it is hard for them to obtain education and jobs, yet Travellers want services from the Irish government. A recent example was a community of six brand new four and five bedroom homes that was “donated” by the Tipperary government to Travellers but since it didn’t include 2 stables and grazing land for each $500,000 new house, they weren’t interested. They have been living across the way in a “temporary settlement” for 50 years and vow to stay there unless they get enough land and stables. On my website, I’ve got an aerial view that shows the encampment. It is literally just a bunch of trailers on the side of a road. The Tipperary councillors are not amused, yet the dilemma continues as the parties try to mediate the matter. During my recent medical trials and tribulations, I watched hundreds of hours of videos of life in Ireland. The romanticized view of Travellers is sort of Gypsy like, but they are not genetically related to Roma gypsies. They are sometimes called Tinkers, because many Travellers could fashion metal into pots, pans and make other useful items like soap for the “stable” Irish. There was, for many years, a sort of happy truce between the Irish and the Travellers, but as Ireland has become a healthy, vibrant modern environment, Travellers became a problem. One was the Irish desire to help the Travellers become normalized, but since they don’t want to be normalized, there is friction. Two was the desire to “clean up” the community and having Travellers with their wagons, horses and encampments just roving around the country was not fitting Ireland’s image of a modern society. Then there is a widespread belief that Travellers commit crime in far greater volume than the general population (while about .5% of the population, they comprise 10% of the prison population, a factor of 20x). So Ireland has been struggling about what to do about these nomads for years, with claims of prejudice against Travellers on one side and “common sense” on the other. On October 26, Ireland held a presidential election and a candidate, Peter Casey, said that Travellers were as Irish as everyone else (Travellers disagree) and that they shouldn’t be treated any different than the rest of the Irish. Well, you’d have thought he just declared the Leprechaun a descendant of Satan. The uproar in Ireland was deafening: how dare a presidential candidate be so racist!? You see, Travellers obtained special ethnic status last year from the Irish government. Casey called that decree a “load of nonsense. They are not from Romany or whatever… They’re basically people that are camping on somebody else’s land. The poor farmer whose land that they camped on, you know, who’ll buy the land off him?” When called out as racist, he said: “You can’t be a racist if you don’t regard the people you are talking to as a different race. They’re not. They’re Irish and they’re proud Irish people, so that’s not possible really.” Casey went from 1% in the polls to over 23% on election day. While the incumbent won easily, Casey’s vaulting into a huge double digit position has excited the intelligentsia to no end. The election is long over, but Casey is still leading the news. Casey appears to have struck a nerve in both the Irish equality crowd, a predominantly youthful movement who believe in equality on a host of issues that defies their island’s religious heritage, and those who don’t appreciate the Travellers eccentric ways but are afraid to speak up, so they let their vote speak for them, in private. I see parallels to current day America, but I’ll let you decide for yourself if you see the same thing.